The UCMP has joined together with other members of the Berkeley Natural History Museums to participate in the National Science Foundation-funded GK12 program. This program matches graduate students with teachers in local public schools to enrich science education for K12 students. There are about 80 such programs around the country, most of which focus on physics and engineering. 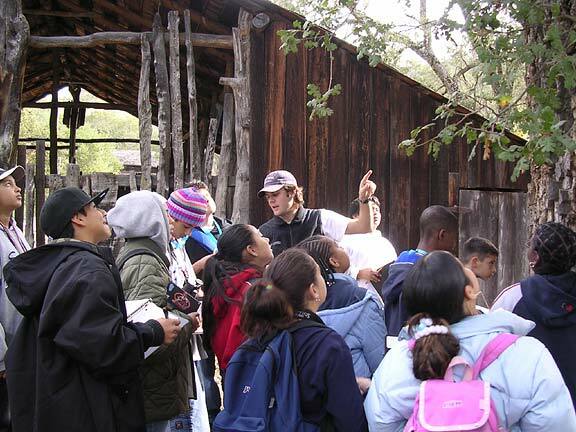 Berkeley’s GK12 program, Exploring California Biodiversity, is one of the first to be based on biology and environmental science. Brian Kraatz shows students from Adams Middle School how acorn woodpeckers store acorns in oak trees at Hastings Reserve. field trip each semester, as well as shorter day trips. Most of these field trips are to UC nature reserves, from the coastal Bodega Marine and Angelo Coast Range Reserves to the Sagehen Creek Field Station in the Sierra Nevada Mountains. Classes also visit UC Berkeley’s campus to tour the Berkeley Natural History Museums. The program is designed to get students excited about and involved in the process of science, including the importance of natural history museums like UCMP. Eight UC Berkeley graduate students, including three UCMP students (ourselves and Crissy Huffard), work with middle and high school science teachers in public schools in and around Berkeley. We are able to work with the same students throughout the school year, leading weekly lessons and day and weekend field trips. As students engage in the process of science, they work with us to develop and test hypotheses about biodiversity. Current projects include comparisons of plant and arthropod communities from different habitats, restoration of degraded watersheds, and a study on the ecology of invasive species.